Currently-affiliated students, faculty, and staff, use this login to request books from other regional libraries through EZ Borrow. Books and journal articles not included in Andruss Library’s collections may be requested via a service called “Interlibrary Loan” or “ILL.” Through cooperative agreements with other libraries, resources across the nation are available to eligible Bloomsburg University users. Interlibrary Loan may NOT be used to avoid purchase of required course materials. Students are expected to buy required textbooks. Faculty should consult with the Acquisitions Librarian regarding possible purchase of books, videos, or DVDs to be placed on reserve as well as visual materials that will be used repeatedly in their classrooms. Interlibrary Loan and E-ZBorrow materials may NOT be placed on Reserve. Because copyright law restricts the number of articles that may be ordered without paying (sometimes significant) royalties, faculty members should check library resources before making assignments using recent periodicals. At Andruss Library, ILL is available to faculty, staff, and students when materials they need are not in our collection or available through our many online resources. Faculty and Staff with Emeritus status are also eligible. Please, ALWAYS check BU Books (online catalog) for books or the Periodical Title List for periodicals before ordering through ILL to make sure we do not own what you need. You may consult with a Reference Librarian if you are unsure how to do this or encounter any difficulty. What’s the difference between EZ-Borrow and ILLiad? EZ-Borrow is an unmediated borrowing system encompassing over 50 academic libraries in Pennsylvania, West Virginia, New York and New Jersey. Users may search and request books for themselves. Delivery time is usually within 3-5 business days. Books borrowed via E-Z Borrow may be kept for 12 weeks. We encourage you to try E-Z Borrow FIRST for your book requests before turning to traditional Interlibrary Loan (ILLiad). ILLiad can be used to submit book, book chapter, article, thesis requests and more. Library staff will view the request and locate a source for the material from libraries across the U.S. Loan periods for books and other items borrowed via ILLiad can vary from two weeks to six weeks. Most of the time, we are able to obtain materials at no cost. If you are willing to pay for an item, please note the amount in the “notes” field of your ILLiad request for the item. Please note: due to copyright guidelines and the cost of copyright royalties, we cannot obtain duplicate articles for users during a calendar year. Please be sure to SAVE or PRINT your articles for future reference. Many articles will arrive within 24-48 hours. Loans of books and microfilm are often available within one week. However, more difficult items could take as long as two to four weeks, so please plan ahead. The time it takes depends on how many libraries we have to try before we are successful and what method of delivery the lending library uses. Certain items, such as rare books, very new books, audio-visual material, and theses can be difficult to obtain through Interlibrary Loan. You will be notified if we are unsuccessful in filling your request. You will be notified by email when your requested material has arrived. Books may be picked up at the Library Circulation Desk whenever the library is open. Microfilm and microfiche must be used in the Library. Occasionally, other material may be restricted by the lending library to "library use only." The Circulation Desk staff will hold your University ID while you are using the item. Articles are posted to your ILLiad account as a PDF. You will receive a notification email with retrieval instructions. Loans (books, AV materials, etc.) can be returned to the Library Circulation Desk whenever the Library is open. Please do NOT use the outside book drop. Articles are yours to keep. They are only made available for electronic retrieval for 60 days after arrival, so please retrieve them promptly. Yes, renewals on Interlibrary Loan material may be requested prior to the due date. ILL materials are only eligible for one renewal.Some materials are marked as 'no renewal' when you receive them. These may not be renewed. Renewals are made at the discretion of the lending library. If your renewal request is denied, the material must be returned to the Andruss Library on or before its original due date. To request a renewal, log in to ILLiad and click on 'View-->Received Materials'. Click on the transaction number of the item you'd like to renew and then click on 'Renew Request' in the upper left. ILLiad will issue a default renewal date until we hear back from the lending library. You will be notified by email with the approved renewal date OR if the renewal is denied. ILLIad -- enter your full email address -- e.g. ab1234@huskies.bloomu.edu -- and your email password. EZborrow -- may prompt for either email address/password or LIB# (also called Library Account #). 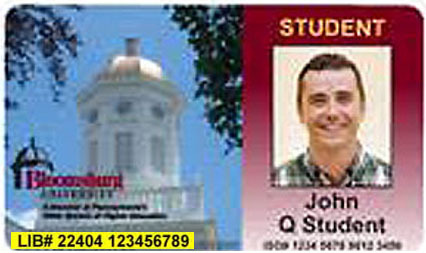 Enter LIB# from the lower left corner of your BU ID card, with no dashes or spaces.